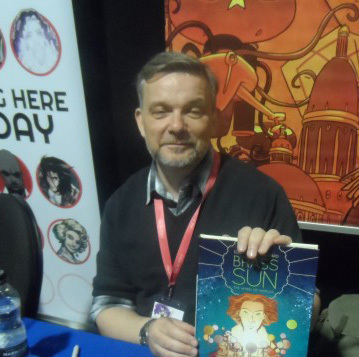 A veteran of ‘The Galaxy’s Greatest Comic’ – 2000AD – Ian has written a multitude of well loved stories over the years such as Stickleback, The Red Seas and Judge Dredd, but specialises in steampunk tales such as the award winning Brass Sun and Scarlet Traces, which continues the story of H.G. Wells’ The War of the Worlds. This entry was posted on September 24, 2015 by captionfestival in Guests, Images.